Amaco Underglaze Chalk Crayons and Pencils can be used for a variety of drawing techniques on bisque ware. Chalk Crayons can be used as is, sharpened for fine detail or dissolved in water for painting or spraying. Underglaze Decorating Pencils are ideal for shading, fine line drawing or identification. Chalk Crayons From intense hues to pastel tones, Amaco Underglaze Chalk Crayons can be used as is or sharpened for fine detail. Water can also help with shading and blending once the chalk has been laid down on the surface. To reduce smudging the Chalk Crayons while glazing, mix 1 tablespoon of AMACO gum solution to one pint of water and spray on work before applying glaze. Pencils Underglaze Decorating Pencils are ideal for shading, fine line drawing or identification. Apply the underglaze pencil to bisque ware to create a variety of unique decorative designs. 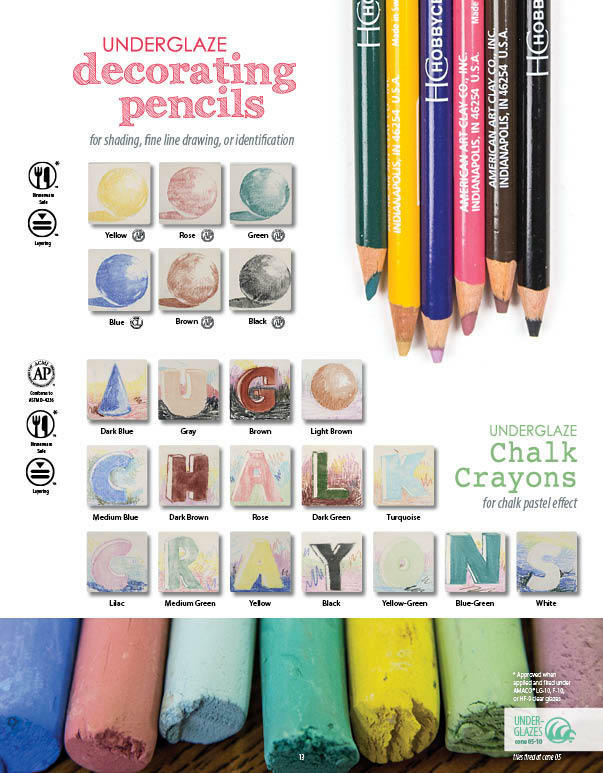 Here is a downloadable PDF of the Underglaze Chalk Crayons and Pencils Page from the 2015 glaze brochure.